In a large saucepan, whisk together 1 1/2 cups (375 ml) of the water with the sugar, cocoa powder, and salt. Bring to a boil and let it cook for 45 seconds while continuing to whisk constantly. Remove from the heat and stir in the remaining 3/4 cups (180 ml) water, vanilla extract, and chocolate. 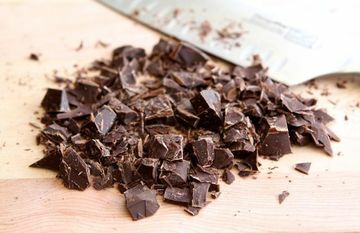 Allow the chocolate to melt completely, then blend the mixture for 30 seconds using either an immersion blender or a standard blender (blending emulsifies the mixture. You can skip this step, but the results won't be as smooth). Taste for salt and sweetness, adjust as desired. Chill the mixture thoroughly (six hours to overnight). Then freeze it in your ice cream maker according to the manufacturer's instructions.